I was as excited as the next Keg drinker when pictures of the country’s CEO flashing down a Keg ka-thate popped up online. For a flirting moment there, I considered that ‘status’ feature that I have never understood pale WhatsApp. But then I remembered! In the early years of the 21st century, I took to this habit of drinking Keg every Sunday afternoon. Even I don’t understand exactly how I operated, because I also used to play football every Sunday afternoon and I spent quality time with my girlfriend every Sunday afternoon. And there is evidence of all that; a long queue of registered voters willing to testify. Back then was the only time keg had ‘Bei Poa.’ 👍A 300ml cup went for Ksh. 15 and a 500ml mug retailed at Ksh. 25. Bei poa! 👉 Also, 300ml was 300ml plus overflowing foam, not like today when it is sold as 50ml beer and 250ml foam. And food was aplenty in the country too; patrons never used to chew the edges of the mugs back then. Owing to the beauty of the mugs, they became treasured souvenirs we all wished to carry away with us. But the mugs at the pub were heavily guarded. If you were served a glass 500 ml mug, you drank with two soldiers standing by you on each side like those guys beside King Diamond in that ‘Salome’ video. Some pubs actually employed guards to ensure the mugs did not leave the premises. But who were we! The high-security levels only made the treasure hunt more exciting. So, on this one occasion, I got so plastered and ended up with a 500 ml mug at home. I don’t know exactly how I executed that particular mission, but I woke up to find it among other utensils in the kitchen sink. Then came my old man, who noticed it like sitting there like a sore thumb while in all my years of existence I believed he never looked at anything in the sink. Upon inquiry about where it came from, my sharp mind came up with the sharp answer that I saw it on our way to a football match at kina Kioko M.Mnthungu‘s place and thought it was excellent to drink water from instead of taking many rounds using small cups. I used to chuckle every time I saw the old fella take a thankful swig from that mug, although I always had a deep seated fear that he was fooling me. 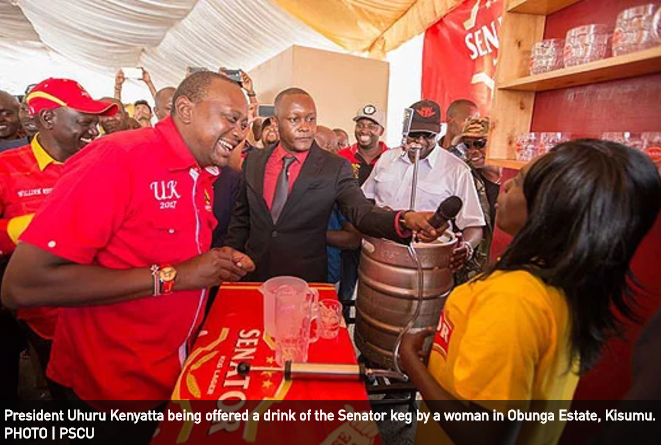 Now I am working closely with NIS to ensure the said images of Kenya One kegging don’t go any more viral than they already have.